The weather and environment in the UAE can reach extremes during the summer, and this can have a negative effect on surface of your vehicle. Extended exposure to sunlight and UV rays can damage your car’s paint. This may result to fading, peeling, and cracking. Take measures to protect the exterior of your car today with expert car polish in Dubai today from DITEC. 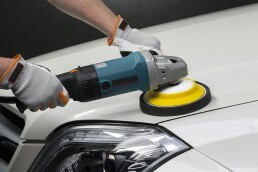 DITEC is one of the leading car detailing companies in the UAE today. We offer a complete arrange of polishing services for vehicles of all shapes and sizes. Drawing from more than three decades of experience in providing expert services in the vehicle detailing industry, we combine significant technical expertise with relevant experience in order to deliver services that are aimed at achieving precise and exact results. Our mission is to provide premium services at affordable price ranges to give our clients supreme value for their money. Gold Program – includes a complete array of premium services such as polishing, degreasing, washing, extensive interior cleaning, and surface protection application. Silver Program – comprises everything you need for a clean and good-looking vehicle, with none of the extra luxuries: surface cleaning and buffing, paint protection, extensive interior cleaning, layering of ceramic paint protection, and liquid protection. Bronze Program – has everything you need for a clean-looking vehicle. Package is inclusive of polish application, washing and waxing, window cleaning, layering of carnauba wax.